We have been in the manufacturing of excellent quality Telescope without any compromise on quality. Our Telescope are trustworthy, manufactured using latest techniques with zero percent compromise on quality.These brass antique Telescope reproduction optical instruments are made using heavy solid brass tubes and fittings, and polished to a beautiful finish. We have more size in brass antique Telescope start from keychain,6 inch to 1 meter telescope with stand in defferent design like as wooden, leather, brown antique polish, nickel polish, Black antique. as per buyer provide logo we print & use secrecy policy. 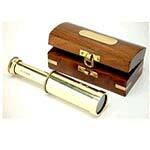 we also offer wooden box, leather box & eye catching telescope. We have very reasonable prices to offer you for the excellent material purchase. 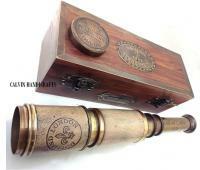 BRASS NAUTICAL TELESCOPE WITH BOX 6 \"
18 inch solid brass handheld nautical telescope with white antique Leather. special for telescope in eyepcs,pipe engrave the Kalvin & hughes london 1917 and also leather.